This is a beautiful and elegant dress. 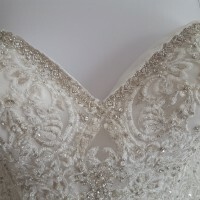 The bead and lace appliqué is perfectly done and just enough sparkle to catch the eye. The train is flowing without being over bearing. The dress has a zipper back with about 6 inches in length of hooks starting at the top of the zipper. Buttons cover the zipper. The dress moves easily even with the several layers under the dress. The dress has buttons added to bustle for the evening. Dress is a 2018 dress. We are happily married and this dress is helping pay for our honeymoon! Your perfect wedding dress is right here! Just the floor length. I am 5'5" but with the shoes I was 5'8".